Soldiers rescued 43 cattle farmers abducted by Islamist militant group Boko Haram in north-eastern Nigeria, an army spokesman said Monday in Abuja at the Defence Headquarters. The military operation for the mission was carried out on Sunday morning after eight suspected Boko Haram terrorists abducted some cattle rearers and livestock at gunpoint at Dalakalari general area, Mafa Local Government Area. Some well meaning people informed the military who swung into action and pursued the terrorists. The terrorists, sensing danger, ran and abandoned the livestock just before Panamri village. Eight Boko Haram fighters abducted the farmers and about 500 cows at gunpoint in the Mafa local government area in Borno State, according to spokesman Colonel Sani Usman. The military pursued the terrorists and managed to rescue all hostages several hours after the abduction, Usman said. Boko Haram poses a steady threat to communities in the north-east of Nigeria and has also launched offensives in neighbouring Chad, Niger and Cameroon. The group’s goal is to enforce a strict interpretation of Islamic law, known as sharia. Since 2009, at least 14,000 people have died at the hands of the Sunni fundamentalists in Nigeria, Chad, Cameroon and Niger. According to the United Nations, an estimated 2.7 million people in the region have fled their homes due to Boko Haram. Boko Haram, referred to by themselves as Wilayat Gharb Ifriqiyyah (Islamic State West Africa Province, ISWAP), and Jama’at Ahl as-Sunnah lid-Da’wah wa’l-Jihad “Group of the People of Sunnah for Preaching and Jihad” is an Islamic terrorist group based in northeastern Nigeria, also active in Chad, Niger and northern Cameroon. Boko Haram has also been translated as “Western influence is a sin” and “Westernization is sacrilege”. The group’s leader is Abubakar Shekau. The group had alleged links to al-Qaeda, but in March 2015, it announced its allegiance to the Islamic State of Iraq and the Levant (ISIL). Since the current insurgency started in 2009, it has killed 20,000 and displaced 2.3 million from their homes and was ranked as the world’s deadliest terror group by the Global Terrorism Index in 2015. After its founding in 2002, Boko Haram’s increasing radicalization led to a violent uprising in July 2009 in which its leader was summarily executed. Its unexpected resurgence, following a mass prison break in September 2010, was accompanied by increasingly sophisticated attacks, initially against soft targets, and progressing in 2011 to include suicide bombings of police buildings and the United Nations office in Abuja. In April 2014 Boko Haram kidnapped 276 schoolgirls from Chibok. Shekau announced his intention of selling them into slavery. More than 50 escaped. The incident brought Boko Haram extended global media attention. In mid-2014, the militants gained control of swathes of territory in and around their home state of Borno, estimated at 50,000 square kilometres (20,000 sq mi) in January 2015, but did not capture the state capital, Maiduguri, where the group was originally based. Starting in late January 2015, a coalition of military forces from Nigeria, Chad, Cameroon, and Niger began a comprehensive campaign against Boko Haram. And with the arrival of new military hardware from East-Europe including the T-72 tanks, Helicopter gunships(Mi-171Sh, Mi-35 Terminator Assault Helicopters), Nigerian Military were able to effectively change the narrative in the battle against Boko Haram. On 7 March 2015, Boko Haram’s leader Abubakar Shekau pledged allegiance to ISIL via an audio message posted on the organisation’s Twitter account. Nigerian army spokesperson Sami Usman Kukasheka said the pledge was a sign of weakness and that Shekau was like a “drowning man”. On 12 March 2015, ISIL’s spokesman Abu Mohammad al-Adnani released an audiotape in which he welcomed the pledge of allegiance, and described it as an expansion of the group’s caliphate to West Africa. By March 2015, Boko Haram tally of lost Nigerian towns included Mubi, Bama and Gwoza to the Nigerian army. The Nigerian Security authorities said that they had taken back 11 of the 14 districts previously controlled by Boko Haram. In April, four Boko Haram camps in the Sambisa Forest were overrun by the Nigerian military who freed nearly 300 females. 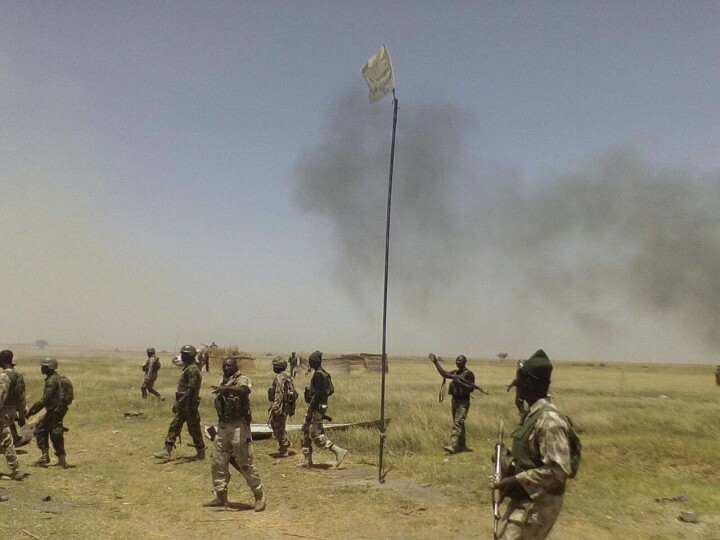 Boko Haram forces were believed to have retreated to the Sambisa Forest and Mandara Mountains, along the Nigeria-Cameroon border, where they have been facing a continuous onslaught from the Nigerian Military. Rebuilding of several reclaimed towns from Boko Haram sect started in 2015 with Assistance from EU, World Bank and United States. Estimates of total infrastructure cost for the North-east is around $2.1 billions.